What’s the first picture of Jesus you can remember seeing as a kid? Was it a classic painting like DaVinci’s Last Supper or a coloring sheet from Vacation Bible School? What did Jesus look like in the picture? Happy or sad? Friendly or scary? Did Jesus look like someone you’d want to know? As parents who follow Jesus, one of our biggest responsibilities is painting a clear and compelling picture of Jesus to our kids. Not literally, of course, but by the way we live. Kids need an example of Jesus they can imitate, and they need simple language to help them understand how they can live out that example in everyday life. One tool that’s been helpful in our home is called the Triangle. There’s nothing magic about it. It’s just another picture of the life of Jesus that all ages can understand and imitate. For a quick overview of the Triangle, check out this earlier post. 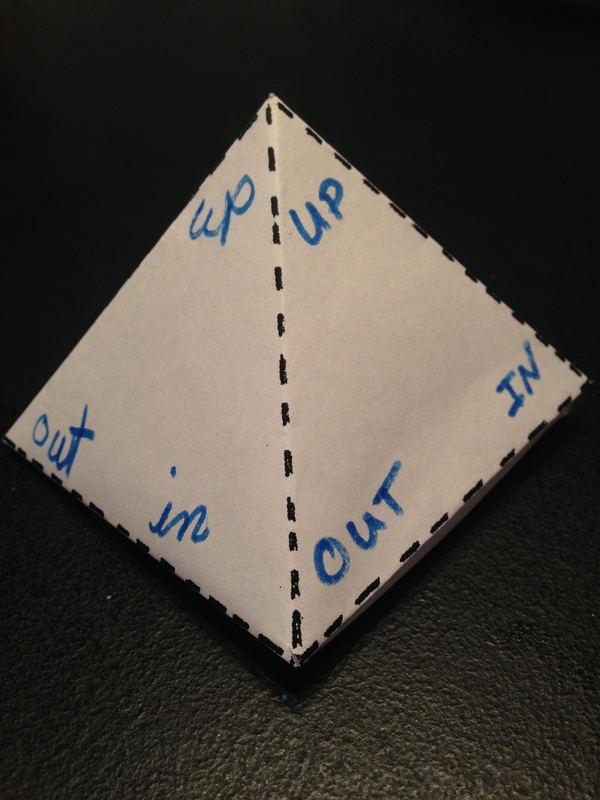 One of the ways we’ve used this with our kids is by making a paper pyramid we keep on our dinner table. 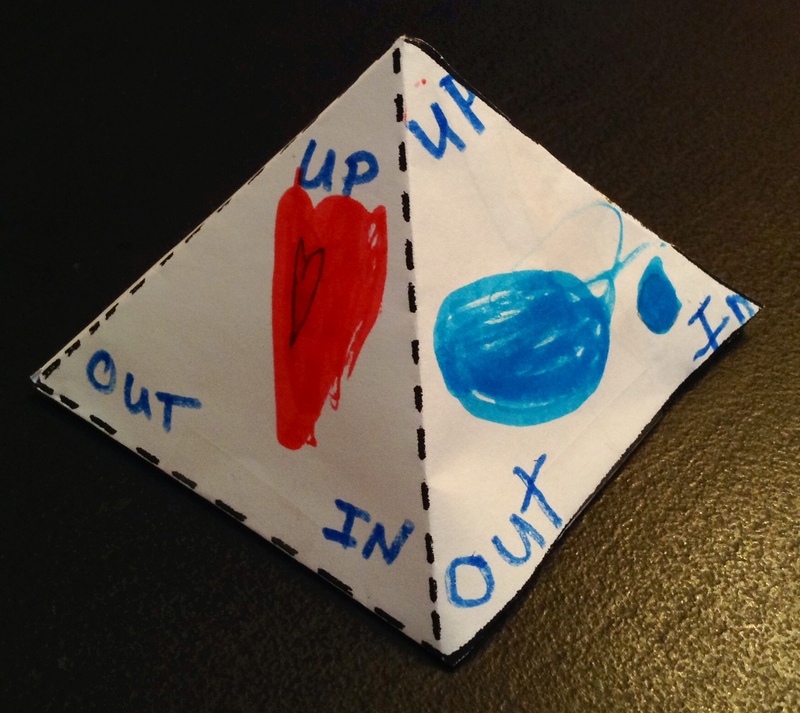 This pyramid craft has been a great tool to get us talking about what following Jesus looks like in everyday life. It was so simple even my six-year-old caught on right away. 1. Start by printing out a paper pyramid template. You can find a variety of them online, but I used this one from Strorycraft.com because it looked simple but sturdy. 3. Now, let them take turns writing UP, IN and OUT on the blank sides of the pyramid template. Ask them what pictures they think of that would be good reminders of how Jesus lived UP, IN & OUT and let them draw one of those pictures on each side triangle of the pyramid. Talk about why they chose those images. 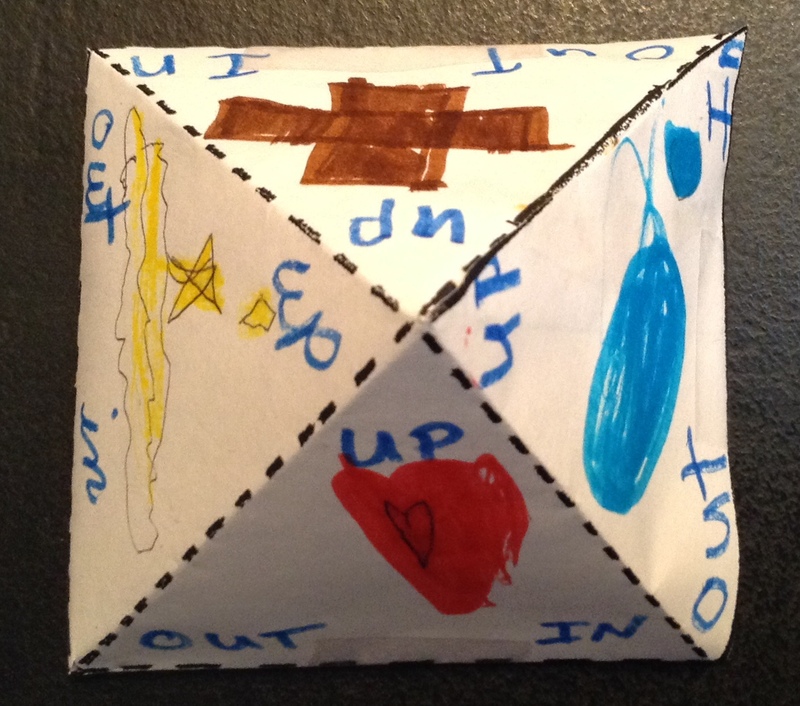 UP – a brown cross to remind us of God’s love for us and a yellow picture of Jesus (He’s the star) ascending through the clouds to go back to the Father (the diamond my daughter drew above Him). IN – a red heart to remind us to love others. OUT – a blue circle to remind us that God is everywhere in the world. 4. Once the craft is done, ask your kids for examples of how your family does UP, IN & OUT. Which ones do you do a lot? In which area do you need to grow? Choose one practical thing you can do to take a step in that area this week. Both of my kids gave great examples. Last year, when my oldest daughter was in public school, she recognized we were doing a ton of UP and OUT but weren’t spending much time living IN community with other believers. So we prayed about that and began to devoting more intentional time for community with other families. This year we’ve transferred to a wonderful Christian school and are strong in UP and IN but not spending much time reaching OUT. So my kids decided we would continue to pray for God to send us people outside the church to love (what we call people of peace) and in the mean time we could make some cards for some friends who don’t know Jesus. 5. Once you’re finished, use the pyramid as a centerpiece for your dining room table and take some time once a week over dinner to review your previous week and where you can focus for the week to come. Over time you’ll begin to see that you’re painting a beautiful picture of the life of Jesus that your entire family can imitate together. For a more in-depth look at the Triangle and other LifeShapes, check out the book Building a Discipling Culture by 3DM Publishing.